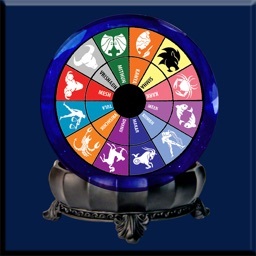 Daily Horoscope - Get your Free Horoscopes for Love, Money, and Health and more! 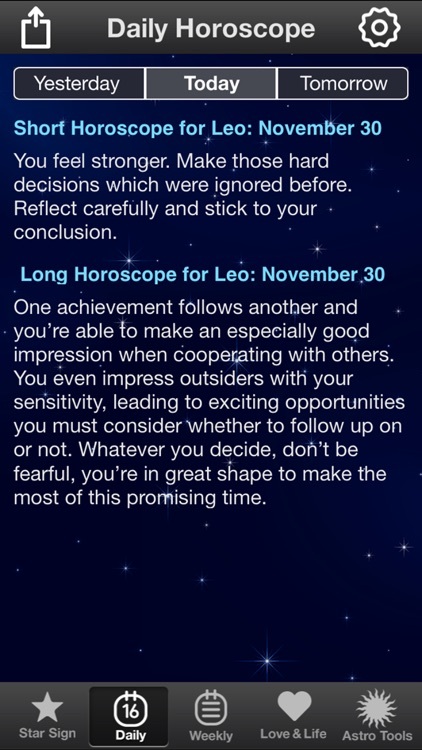 See what the stars are saying to you today! 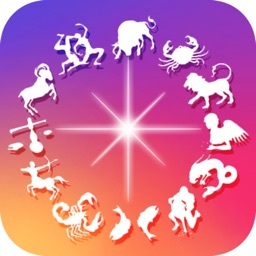 Daily Horoscope is the HIGHEST RATED and MOST PROFESSIONAL horoscope app around! • Our FREE short Daily Horoscope is updated daily by our professional astrologers. • Early access tomorrow's Daily Horoscope or see what happened yesterday as well. • Get your extended Weekly Horoscope with a new reading every week! • Get all of the above readings for all 12 zodiac signs: Aries, Taurus, Gemini, Cancer, Leo, Virgo, Libra, Scorpio, Sagittarius, Capricorn, Aquarius, Pisces. • A longer, more comprehensive Daily Horoscope reading (averaging over 100 words) to give you a more detailed look at your day. • Access to tomorrow's extended Daily Horoscope reading as well as the ability to look back and see yesterday's. Access to our Love & Life astrology section. 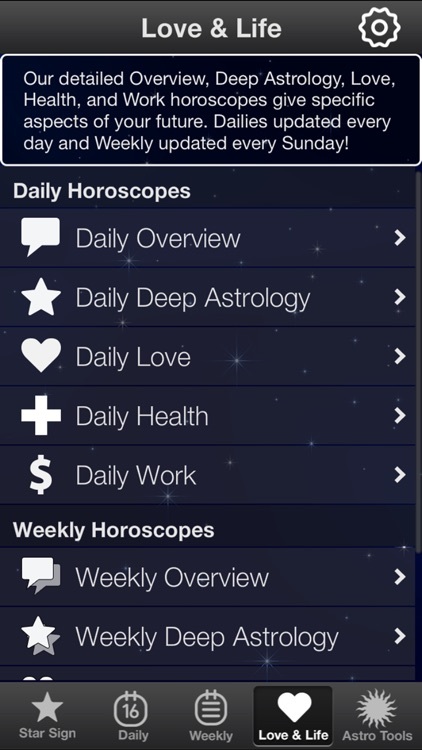 This section gives Daily and Weekly readings looking at different aspects of your life. 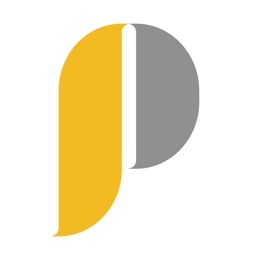 All readings are longer and more comprehensive than our free short readings. • Daily Overview: Get a full, longer version of your general Daily Horoscope with projections for today and into the following days. • Daily Deep Astrology: See how the planets, houses, and signs are affecting you in this deep Daily Horoscope. • Daily Love: Get a reading into Love and Romance for your sign in this Daily forecast. • Daily Health: See how your Health and Wellness is affected by the movements of the stars today. 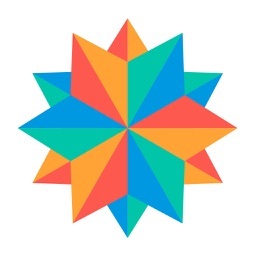 • Daily Work and Money: How are the stars affection your work or financial situations today. 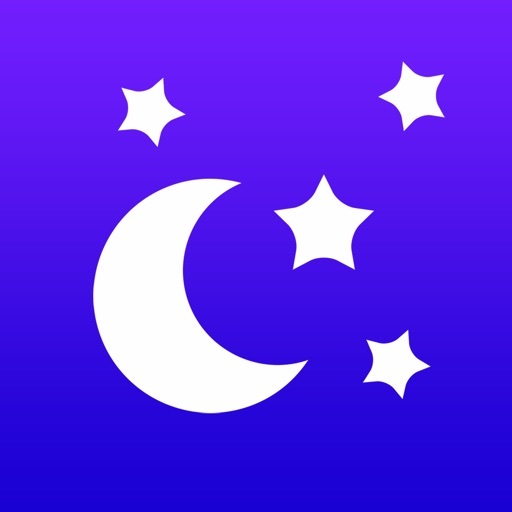 • Daily Health: See how your Health and Wellness is affected by the movements of the stars this week. • Daily Work and Money: How are the stars affection your work or financial situations this week. 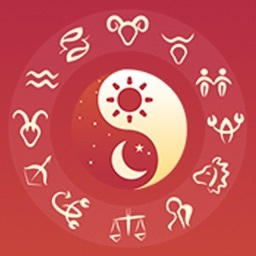 Access to our Astrology Tools section with reading on Love Matches and Sign Compatibility as well as tools to help you better understand your forecasts. 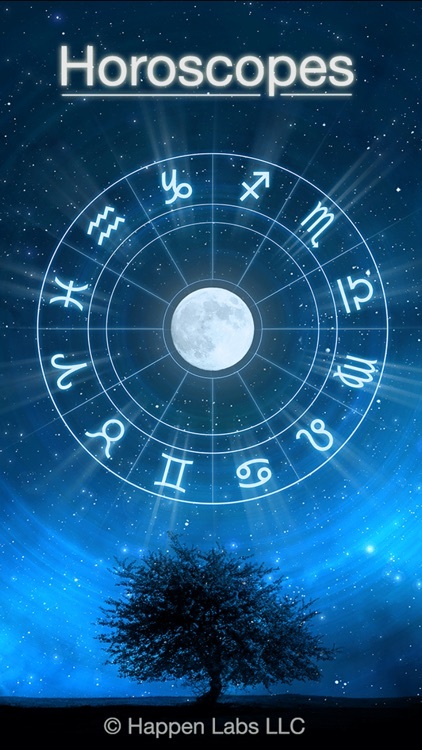 • About Your Sign: Get a complete profile of the nature of your sign or any of the 12 Zodiac Signs. 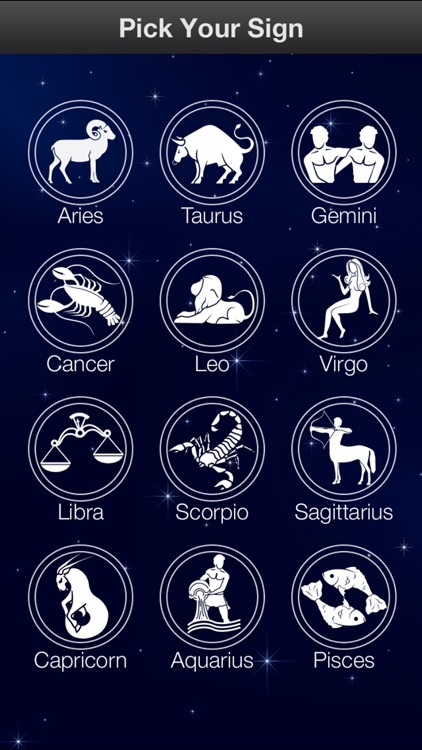 • Sign Comparisons: See how the different Zodiac Signs interact, both positively and negatively. 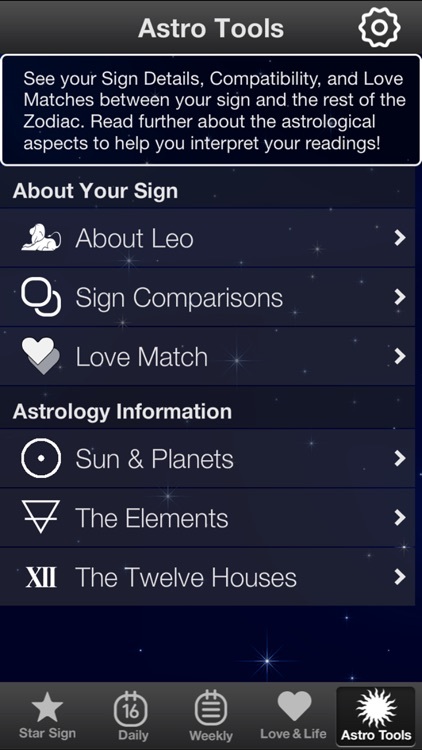 • Love Match: Find our how romantically compatible you are with other Zodiac Signs. See where you fit well together and what potential difficulties may arise. • Sun & Planets: Information on the influence of the Sun, Moon, and Planets in your readings. • The Elements: Information on the role of the Elements in your readings. • The Twelve Houses: Information on how the houses and how they influence your forecast. Subscriptions to our Premium Astrology content give full access to all of the above content for the length of the subscription. Subscriptions are available in the following time lengths and prices: 7 Days for $1.99, 1 Month for $4.99, 3 Months for $12.99, and 1 Year for $49.99. Payment will be charged to iTunes Account at confirmation of purchase. Subscription automatically renews unless auto-renew is turned off at least 24-hours before the end of the current period. Account will be charged for renewal within 24-hours prior to the end of the current period, and identify the cost of the renewal. Subscriptions may be managed by the user and auto-renewal may be turned off by going to the user’s Account Settings after purchase. No cancellation of the current subscription is allowed during active subscription period. Any unused portion of a free trial period will be forfeited a subscription is full subscription is purchased.